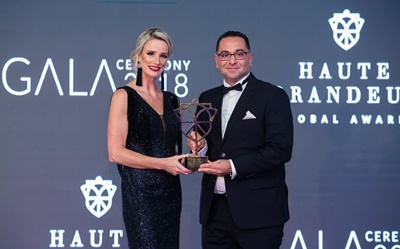 Millennium Plaza Hotel Dubai, a luxurious hotel, located at the footsteps of the Emirates Tower Metro Station, has been presented three awards at the Haute Grandeur Global Hotel Awards, 2018. The awards ceremony was to honor and recognize excellence and highest achievements from across the global hotel industry. The 65-storey tower of Millennium Plaza Hotel Dubai offers 398 guest rooms with stunning views of the Zabeel Palace and Jumeirah Beach. Guests can also enjoy the Infinity Health Club and Spa, the Club Lounge, and the temperature-controlled swimming pool with views of the Arabian Sea. Not just that, they can also take a look at the newly renovated lobby that exudes a renewed sense of warmth. Its modern design is characterized by sleek couches and chairs in earthly brown and yellow hues with new light fixtures that provide a welcoming ambience for guests.